Does the Profoto B2 Have Enough Power at 250Ws? Recently announced at the head of WPPI a couple weeks ago, was the Profoto B2 strobe system. The unit, small in comparison of its competitors, was arguably the most exciting product announcement this year at the popular photography convention. However, the burning question everyone has been asking is… is 250Ws enough for on location work like Profoto suggests? Admittedly, I was one of the biggest skeptics. If you’re at all familiar with my work, you know that I have a habit of using intricate lighting arrangements on location, paired with ND filters to stop down the ambient light, allowing me to shoot at f/1.2-f/3.5 for the majority of my work. Because of this, I am typically overpowering the sun, firing at full power to achieve the lighting I need to overpower both the 4-8 stops of ND on my lens and harsh desert sun while maintaining a shallow depth of field. So when I’m maxing out my Profoto B1s at 500Ws, I have to assume that the Profoto B2’s 250Ws is not nearly enough, right? Wrong. Light works slightly different than what one might think. You’d assume that 500Ws would give you twice the power that 250Ws would give you, giving you a massive advantage in power and versatility, but it doesn’t work quite like that. Sure - it’s double the power, but that equivalents to about 1 additional stop of light in total. You see, one stop of light refers to either doubling the light, or cutting the light output in half. 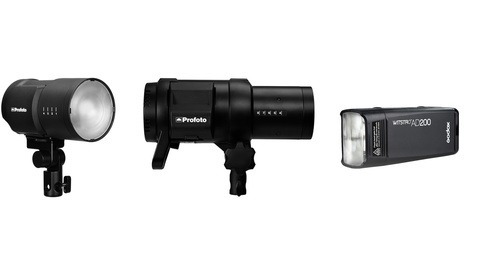 So with that said, the Profoto B2s are only one stop short of what the Profoto B1s and other popular strobes are. So when shooting at 1/200th of a second at f/2 at 500Ws, the same can be achieved using 1/200th of a second at f/1.4 at 250Ws coming from your strobe. Here, let’s get a visual out of the way to hammer this idea home. Another function to address with the new Profoto B2s is the High Speed Sync (HSS) functionality built into the unit. This allows you to shoot at sync speeds faster than 1/200th of a second, by firing multiple strobe flashes during the duration of the shutter opening and closing. This allows you to stop down on ambient light, without effecting the off camera flash (with the exception of power limitations). While firing at 1/8000th of a second means you'll be losing power from your strobe as well (it can only fire so many times at full power firing 1/8000th of a second), I've found that it works well at maintaining consistent lighting power, while still overpowering the sun. While using HSS sync will cut the power consumption down on the strobes, it cuts down the power at a much slower rate than an ND filter would at full stops. So with that said, the Profoto B2s are more than enough power to use for outdoor uses. Evidence of this also comes in the fact that the Canon 600EX-RT is around 70Ws, and is considered one of the most powerful speedlights available for photographers. 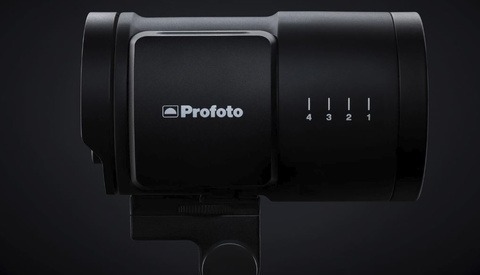 That puts the Profoto B2 at about 3.5 times more powerful than a standard high end speedlight. At first, I was a huge skeptic on whether or not 250Ws would be enough for my needs on location. After using the B2s on bright, cloudless days with ease, I'm more than confident that 250Ws is enough power for the average photographer. If you'd like to know more about lighting and test out the Profoto B2 (and B1) strobes for yourself, I am hosting a series of two day workshops all over the United States in the coming months. These workshops are 2 day workshops where day one focuses on lighting using off camera flashes in an outdoor environment, and day 2 focusing entirely on marketing your business and high end retouching. With over 15 hours of education, the seating of these workshops are extremely limited, and can be reserved on my workshop website. The first set of workshops are set to take place in Miami, FL, Phoenix, AZ, and Denver, CO. The B2's are powerful enough if your flash is within 2-3 feet of the subject. Try to get a landscape, waist up portrait at a more reasonable 5-8 feet from softbox to subject and you would likely be pushing past the limits of 250Ws on a bright sunny day. The inverse square law would suggest that it could be done. Remember, light falloff is inversely proportional to the square of the distance of the light. So every time you double the distance your light is from your subject, you're only losing (1/2)^2 or 1/4th of the power (roughly). An object that is twice as far away from the energy source as another object receives one quarter of the energy. Great article though. Thanks for all your time and effort to make posts! Sorry Zach, that is not right. You are losing 2 stops, i.e. double the distance, ¼ the power. Not ¼ less, that would only be a half stop loss, if only, but alas it is not. Hi Zack, do you still feel confident about B2's power now that you are aware of that every time you double the distance you will only have 1/4 of B2's power? It's really not promising. Even with the B1 it can barely overpower the strong sun in the event of shooting a full body portrait with softboxes. I add a 3stop ND filter. Allows me to use more flash power. ND filter will allow you to sync your flash in bright daylight but it reduces the power of flash as well. How is that? If I can avoid using HSS (where power is reduced) and stay at, say 1/200s? With 3stop ND you are only at 1/8 power. What good is that for? If I need f2 and 1/1600s, I could use 1/200s with 3 stop ND and use the flash to lighten up the model. The web is full of examples that this works nicely. ND cuts global exposure which includes your flash power as well (even your flash output can reach maximum). The reason you see it working is because camera is using F2 which absorbs a lot of light. Same applies to HSS as well. Weak flash output and large aperture counter-balance each other. Yes. But HSS costs you in addition to reducing exposure by increasing shutter speed. Demonstrated nicely by http://neilvn.com/ on his Tangents blog. He measures around 2 stops additional loss in power when switching to HSS with SB910 speed lights, for example. So an ND filter allows for more power if you stay at maximum sync, with the hazzle ofmounting them, focusing etc. Using a B1 or INDRA500 with enough power to start with, I don't basically care anymore. Thank you for this article. I agree that 250Ws would be enough for most of my use shooting portraits, but the real question is why should I consider the B2 if I can get the new Elinchrome ELB 400 which has more power and is less expensive! And I don't care about TTL, never used it! Can anyone give us a good comparison between those portable systems as I am really considering getting one of them? 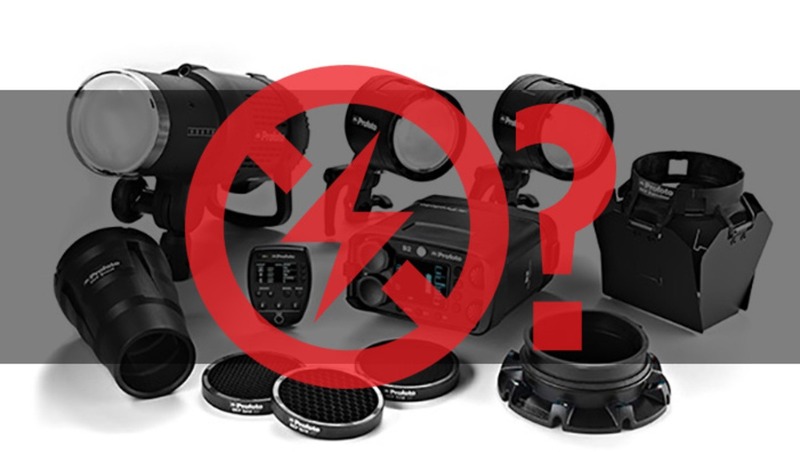 You are right that a pro wouldn't rely on TTL when on a shoot. However the Profoto TTL system really works magic in outdoor shooting. It works as a preliminary test flash to give you feedback on your power setting, you then can make a judgement call whether the TTL flash gave enough output and switch("lock on" ) to manual flash mode and make adjustments accordingly. Well TTL is great for speedlights during receptions. Yeah for my portraits I shoot in manual mode. No need for TTL. The thing I question the most about the B2's is the price point. For (1) B2/battery pack vs. (1) B1 the price point is basically the same. But with the B1 I still get my high speed sync plus the extra 1 stop of light. As far as portability goes, well, that can be debated all day long and I think it boils down to personal preference. I have not used the B2's but I have used a Ranger Quadra for the past few years and I have to say that I prefer the overall portability of the B1 with no external battery pack over my Quadra. That isn't even taking into consideration the extra stop of light that does matter, and matters even more when we start getting into HSS. So for me I just don't really get the B2's. Just my opinion though. I know a lot of people have been raving about them and in all honesty, I don't think you can go wrong with either the B1 or B2 as they are both amazing light shaping tools. I would take either of them over my Quadra due solely to the abilities that come in to play with the HSS. If the price point for the B2's had been say, 60-70% of the B1's, I think Profoto would have had a really amazing portable system with the combination of the B1 and the B2. You could have had an extremely versatile 3 light setup for around $4k in that scenario. But here's to dreaming haha. I totally agree with you on the price point. When I initially heard about the 250ws output I was expecting a more economical portable flash solution. Never did I expect the B2 would priced above B1. Especially when you get the location kit with two heads you are not gaining any power at all. 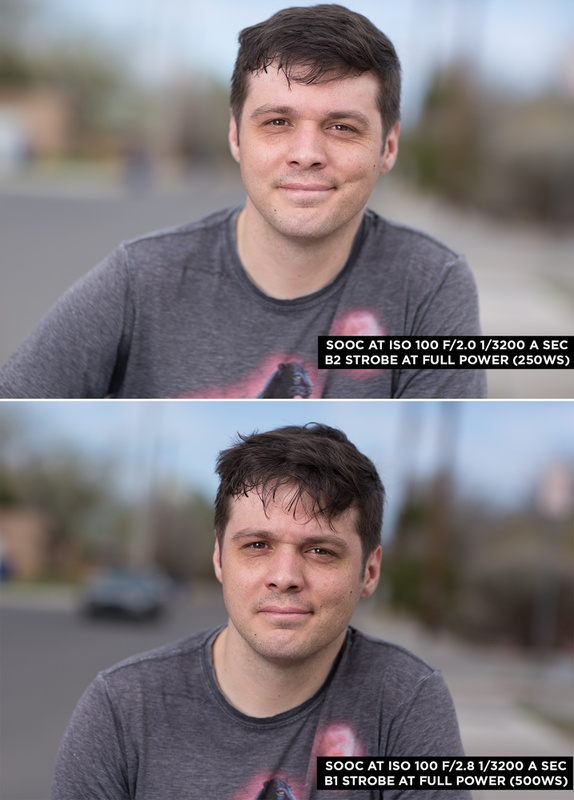 I also had an port unity to play around the OCF line of modifiers a bit, they are quiet plastic in handling. I would much prefer speedlights for portability and B1 or above if I needed the power. B2 fills no need so far except perhaps for folks who want a quick mobile studio setup with 3-4 lights. While there is no question that the B2 comes with a cost, it might be useful for perspective to consider how much a speed light costs. An SB910 with Quantum Turbo 3 is about $1100 and only about 1/3 the power, longer recycle, and more delicate build quality. Not to take anything away from either approach, there is certainly an audience for speed lights and there will likely be an audience for these. It may be true that speed lights are not cheap, they serve a very different purpose when used on camera as fills. B2 is very clumsy to be used as OCF. Yes they do offer more power and fast recycling but one will need to install a bracket, carry the battery pack and mount the trigger and the flash head on. Don't forget to tighten up the 2m long cable! That's a lot of weight! I don't see a situation when people cannot be satisfied with a top of the line speed light on camera. When used as OCF it's a different story. B2 then have an edge over regular speed light in terms of power and easy to fit light modifiers. However it has obvious limitations. B1 will serve better. For first time OCF buyers getting the B1 will not only allow ultimate portability but it also means you get twice the power or twice the charge per battery, it will allow the photographer room to grow from just a run and gun wedding photographer to being able to a true master of light when situation arises...at a cheaper price. I certainly don't have access to the intentions of the designers at Profoto, but it occurs to me that it is quite possible that they were at least partially considering the utility of an ultra-light weight strobe head to be used on a 'lollypop' boom held by an assistant vs. the weight of a mono-head for both active event situations and for creative location portraits. Both are quite common uses for location strobes and sometimes require a little more 'uumph' than a speed light. The example photos show that it's able to shoot other than just headshots. I have full confidence that I can use these on location and get full body environmental portraits without any issues. I got to work with another photographer using these this weekend. While I think they are great, they are definitely far from perfect. HSS is an incredibly useful feature, but remember you can Hypersync when pairing the right triggers with an Elinchrom Quadra system. This gets you that sun cutting shutter speeds but allows you to still fire the strobes at a high power where as the HSS in the Profoto cuts strobe power. Ultimately I think Elinchrom has the advantage here. Really the biggest advantage I see over Elinchrom is the modifier mount. As for comparing to the B1, I find the B1 to be significantly more convenient in the field. More power, and completely self contained. IMO, the only advantage the B2 has is the small heads can quite effectively be mounted anywhere with a Gorilla Pod where the B1 would be too heavy. At the price, I think both the Quadras and the B1 are better location options. The B2 either needs more useful power or a huge price cut for me to consider them. 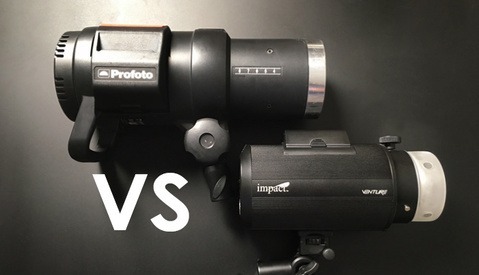 Why would the majority of people choose the B2 over the Profoto AcuteB2 600 for half the price? Not exactly apples to apples. Acute B2 is larger, more cumbersome, and far from ideal power controls. B2 is much smaller and lighter, more protected flash tube, more modern controls, and does offer TTL and HSS. Acute is great if you are locked down on location and very methodically and precisely creating images. B2 is better suited for on the go, run and gun style shooting.